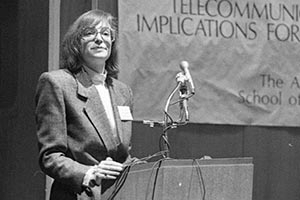 SIS Professor Nanette Levinson speaks at the IC program's 20th anniversary celebration in 1989. A unique and visionary program, the MA in Intercultural and International Communication (IC) and the School of International Service (SIS) was founded in 1968 to address the increasingly important roles that intercultural relations and telecommunications played in Cold War-era international relations. IC was among a handful of academic programs across the US to study these issues, but the only one to find a home within an international affairs school in the 1960s. Today, IC is the oldest program of its kind. During the Cold War, the global reach of media via satellite communications expanded and demand for cultural training for US diplomats, foreign aid workers, and business people going abroad increased. It was in this technological and political context that new opportunities and challenges emerged for those concerned about the future impact of communication on international relations. The IC program was designed to simultaneously explore the "hardware" and the "software" of communication, as well as communication's role in international affairs. To do this, the program uniquely combined the study of international communication and intercultural relations. "Intercultural relations emerged when scholars were trying to understand how culture shapes the way we make meaning of the world," said Professor Amanda Taylor, the current IC program director. "The field asks how we can understand the ways that cultures think about truth, reality, and meaning, such that we can effectively convey messages and build mutual understanding." "Part of the vision of establishing the IC program was to look at communications technology as you would any other important technology, whether it's energy and the environment or weapons of mass destruction," said Professor Eric Novotny, who has taught in the IC program for more than 20 years. "It was quite visionary to establish this area at the time, as it was not in the mainstream of international relations scholarship." The IC program enrolled its first class of 12 students in 1968. Originally, the program was jointly administered by SIS and the Department of Communication in American University's College of Arts and Sciences, but was shortly moved entirely to SIS. SIS Professor Emeritus Hamid Mowlana served as the founding director of the program and, together with SIS Professor Gary Weaver, built up the program in both size and reputation over the next three decades. Mowlana and Weaver combined several aspects of communication-the technological, the international, and the intercultural-to create a truly interdisciplinary program that drew from psychology, sociology, anthropology, and media studies in addition to traditional international relations. "IC's interdisciplinary approach is what distinguished the program when it was first founded and is what distinguishes it now," said Interim Dean Christine BN Chin, a former IC program director. American University had long taught international communication in some form, going back to at least 1951 when a course in international political communication examined "propaganda programs of the major powers" and "the use of various media as instruments of foreign policy," according to a university course catalog. But as domestic and international tumult raged in the 1960s, scholars started to look to communication not just as the vehicle for news and propaganda, but also as a powerful tool for international relations, development, and innovation. Just one year after its founding, the program was already offering students a range of international communication courses on both the established and the emerging elements of the new field. Courses offered in 1969 included Foundations of International Communications, Psychological and Cultural Bases of International Politics, Information and Persuasion in Cross-Cultural Contacts, International Political Communication, and Political Communication and Foreign Policy. IC's specialization in the connections between culture, communication, and conflict was apparent in these early course offerings and informed by its placement in an international affairs school. The decision to place the IC program in a school of international affairs rather than a communications department was itself a forward-thinking idea that allowed for broader engagement with questions of international importance. Novotny noted "the goals of the IC program fit nicely into the traditional mission of SIS, which was firstly to promote peace and conflict resolution, then secondly to engage in strategies for economic and social development. It was natural that the IC program should be an important part of the larger questions SIS was involved in." Taylor highlighted the idea of building peace as one example of how IC students are trained to approach different cultures and question their own understandings: "How is peace understood in a given cultural context? How might that be different from how Americans understand peace? And how might these differences have implications for our efforts to build a more peaceful world?" Since its founding 50 years ago, the IC program has graduated hundreds of master's students and dozens of PhD students. While many of the program's first graduates pursued careers in diplomacy and international organizations, today's graduates enter a wide range of careers in public diplomacy, telecommunications, transnational education, intercultural training, and other fields. Inspired by the IC courses she took, the 1984 undergraduate commencement speaker Lobna "Luby" Ismail used her moment at graduation as an opportunity to share relevant lessons she learned about the field with her fellow graduates. "In my speech, my message was that, no matter where we came from or what we studied, through our experience at this international university and in international service, we learned to engage, build relationships, negotiate, and work with an array of people from different backgrounds," she said. Today, Ismail is the founder and president Connecting Cultures, a cross-cultural communication and cultural competence organization. Dean Chin echoed that sentiment, and asserted that the field remains significant today: "We don't live our lives in segmented ways, and so how we approach our interactions and understanding of the 'other' has to be as complex as our own sense of self. When you enter a new culture, it's not just that people look different from you and speak a different language. They come with historical memories that may or may not involve your country of origin, they may approach resource distribution differently, or they may have different meanings to practices and dimensions in life. The IC program provides students with the intellectual and practical skill sets to navigate that complexity." As the program celebrates its 50th anniversary, IC students, alumni and faculty continue to create innovative ways to navigate the continued complexity of the roles of culture and new technologies in international affairs.